Raaga.com: Nawazuddin Siddiqui’s MANJHI - THE MOUNTAIN MAN Draws Rave Reviews! 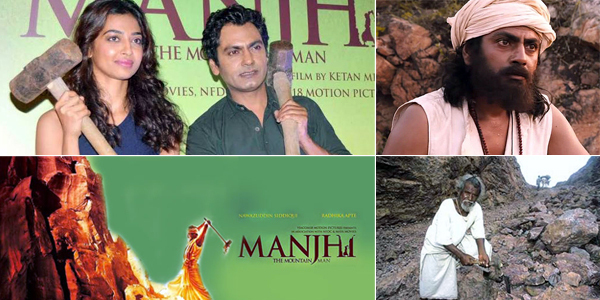 Nawazuddin Siddiqui’s MANJHI - THE MOUNTAIN MAN Draws Rave Reviews! It seems destiny is in all smiles for Nawazuddin Siddiqui, Bollywood’s most versatile contemporary actor. On one hand he has Salman Khan starrer BAJRANGI BHAIJAAN releasing on Eid festival; on the hand the trailer of his forthcoming film MANJHI – THE MOUNTAIN MAN has won rave reviews. Directed by acknowledged art house filmmaker Ketan Mehta, MANJHI - THE MOUNTAIN MAN is a biopic on the life of ‘determined’ landless farmer from India, Dasrath Manjhi, who ‘single-handedly’ carved a path through a mountain in Gehlour Hills, Gaya district, Bihar, using just chisel, hammer and shovel!!! Sounds impossible, isn’t it? But when the illustrious newspaper Tehelka, in 2007, broke the story to the world, readers were shocked. He continued, “At first, people ridiculed him and called me mad for taking on such a herculean task, but as time went by, few people lent me support by giving me food and helping me buy my tools.” “Now, all the people of the Gaya district have nothing but gratitude for me,” he informed with sense of pride. Readers would be surprised to Manjhi worked from 1960 to 1982 day and night and eventually after 22 years broke down the hill and shortened the distance from 70 kilometres to just one kilometer. The path he curved is 360 foot long and 25 foot deep.